People take part in a protest against corruption in Lima, Peru after a scandal involving bribes Brazil's Odebrecht distributed in Peru, February 16, 2017 (Guadalupe Pardo/Reuters). A wave of corruption scandals has roiled Latin America in recent years, from Chile’s campaign finance affairs, through Mexico’s Casa Blanca revelations. Most recently, the information divulged in the December Odebrecht settlement has sent a shudder of fear across regional politics after the Brazilian construction firm admitted to paying nearly $800 million in bribes in twelve countries. The tide of corruption revelations has contributed to massive protests, slumping incumbent polls, and political uncertainty throughout the region. Obviously, the scandals of recent years differ greatly from each other. The Odebrecht scandal was driven by a Brazilian context very distinct from the Guatemalan environment that led to President Pérez Molina’s downfall, or from the Mexican and Chilean cases. Empirical evidence about corruption trends in the region is also quite mixed, with polls showing contradictory findings about the direction of public experiences with corruption victimization and public perceptions of corruption more broadly. For all these differences, there is a common silver lining to the region-wide wave of scandal. 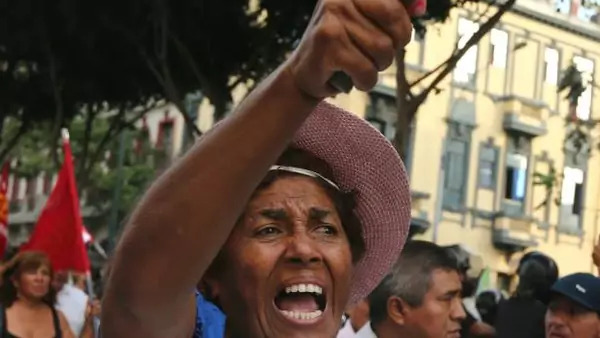 As a perceptive study released this week by the Inter-American Dialogue argues, the region has seen declining public tolerance of corruption and a rising normative edifice that makes it easier to tackle abuses. On the public side, authors Kevin Casas-Zamora and Miguel Carter catalogue a variety of factors that are changing the accountability equation. Citizens are angry: three-quarters of the population in Latin America view their society as unjust, and fewer than two in five express satisfaction with their democracies. An economic downturn has driven down incumbents’ average approval ratings across the region. Meanwhile, citizens are not only more motivated to mobilize, they are better able to do so: the revelations come against a backdrop of improving information transparency, changing access to public information through the widespread adoption of social media, and growth of a politically active middle class. Simultaneously, a “new normative edifice” of international agreements and standards, alongside improved national laws and policies, has given teeth to previously weak anticorruption bodies (see figure below). Laws have been introduced or rewritten in ways that constrain money laundering, reduce campaign finance violations, increase fiscal transparency, and facilitate prosecution. The investigative capacities of police and prosecutors have increased. New bodies, such as governmental auditing agencies and civil society anticorruption organizations, have been created in many countries over the past two decades. Source: Kevin Casas-Zamora and Miguel Carter, “Beyond the Scandals: The Changing Context of Corruption in Latin America,” Inter-American Dialogue, February 2017. The authors are quick to remind us that there is a big gap between laws on the books and “their effective implementation and enforcement.” But the cautiously optimistic conclusion I draw from their analysis is that the pincer movement of greater public mobilization for effective accountability, on the one hand, and institutional changes, on the other, is having tangible effects in fighting longstanding patterns of impunity for corruption across countries as diverse as Brazil, Chile, Guatemala, Honduras, Mexico, and Panama. This two-pronged process may continue to cause political instability for the foreseeable future. And the list of reforms that are still needed is enormous, from structural changes, such as addressing the economic and political disparities that diminish the equality of citizens before the law, to more “technical fixes” such as improving judicial performance and enhancing political finance oversight. But overall, the trend is a largely positive one, with declining public and institutional tolerance fueling corruption revelations. These in turn often generate the political pressure for legal and institutional reforms that have the potential to create less corrupt and more accountable political systems. Whether one agrees with this hopeful conclusion or not, the report is well worth a read, marshalling substantial cross-national evidence on the evolution of corruption and accountability processes across the region.